…. another “summer” that is! Apologies for the lack of news or updates to the website over the summer, for those of you that do not keep an eye on us on Facebook this post will summarise what has been going on in the rescue over the past few weeks. 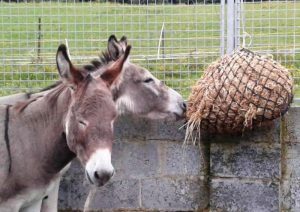 Two new arrivals, donkey buddies, Ned & Nellie, who came into our care due to their owner no longer being in a position to keep them. Thanks to proceeds from Delboy’s Tack Shop we were able to purchase some builders fence panels to create a handling/training area for the gang. 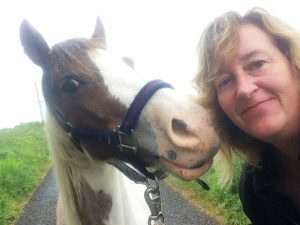 Finn went off to west Clare to spend some time with Louise to improve his handling before transporting him to the lovely Tipperary Mountain Trekking Centre for more handling and backing. Gypsy also went off for handling & backing this month, not quite as long as a journey for her though as she only had to travel to Trix & Kate in east Clare. We got great updates on her progress and it looks like she will be adopted by the family next door to the kind mother & daughter team who fostered & trained her. 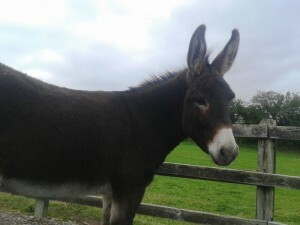 Denny, the donkey who arrived to us in October 2015, said his farewells to us and travelled the short distance to his new home in Kinvara. Himself and his new buddy were far too busy getting to know each other for him to shed any tears for us as we drove away. 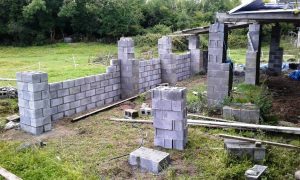 In June we again appealed for assistance in repairing the haybarn roof which had been damaged in the storms last winter and much to our delight James Moroney contacted us to offer his assistance with the block work. 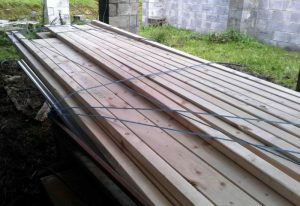 He gave us a list of the materials he would need to fix the pillars and close in the windward side and within two days of them being delivered he arrived to commence the work. 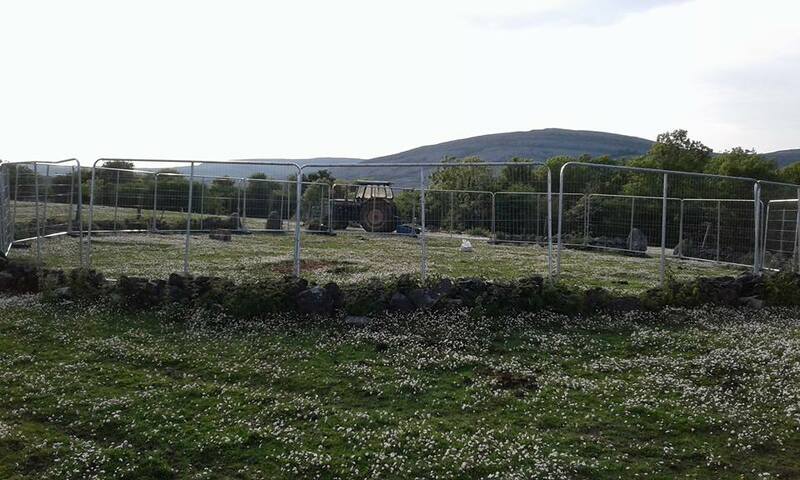 Much to our delight he had the job completed in a few days and it is now ready for re-roofing … lets hope we get a roofing volunteer asap so that the barn is fully functional before our first hay delivery for the forthcoming Autumn/Winter is needed. 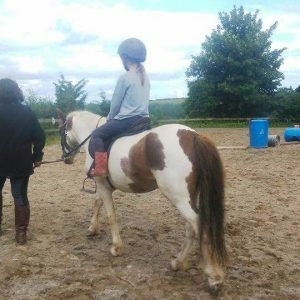 Harry, approx 12’2 3yr old cob gelding, was next on the ‘hitlist’ for handling work and so he has gone to spend some time with Louise in west Clare. 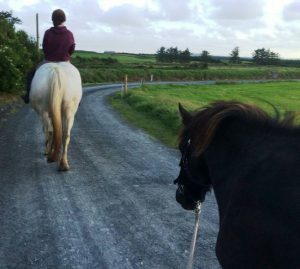 No doubt he has no objections to spending time with Louise’s beautiful mare Anna, he would probably gladly walk all day behind her!! 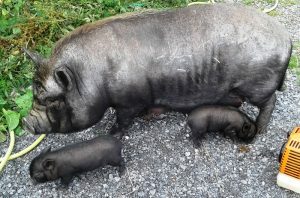 Our previous post telling you all about the arrival of the pot bellied pigs informed you about Dora, Lord Voldesnort (Val), Doris & the subsequent arrival of Doris’ 4 piglets ………… well much to our utter shock on the 1st of July we discovered Dora had given birth to 2 piglets. 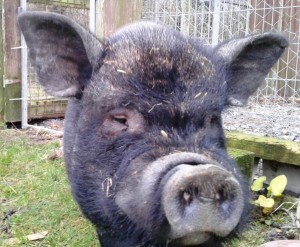 We will not tell you the words that were uttered to Val as a result of our finding and it was clearly obvious that he was a cryptorchid Needless to say the phone calls commenced to more experienced pig people and vets to see how & when Val could be operated on to put an end to him impregnating the sows. 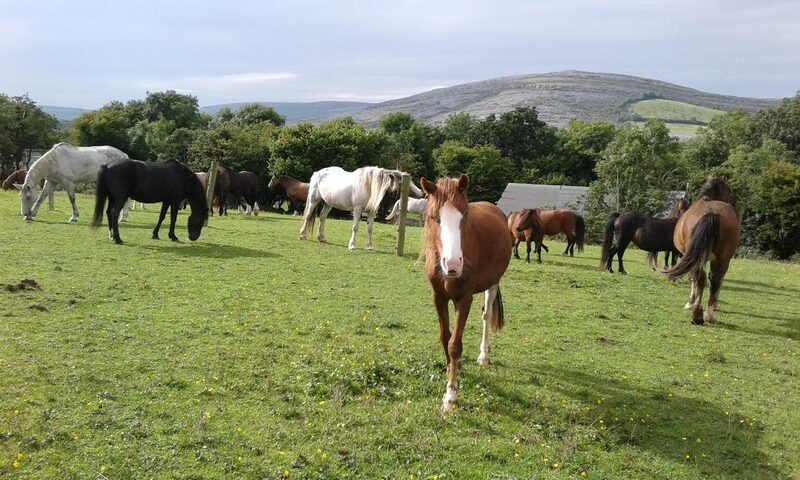 After much consulting and special drugs being ordered the day finally arrived for Val’s big operation at Ballyhugh Veterinary Clinic and thanks to vet Sinead, student vet Martin, vet nurses Aine & Karen we are happy to say it was a success. Louise was also in attendance as she was collecting Hughie to transport him to Streamside Stables in Kerry where he is being handled and backed for riding. A busy but productive day for all. 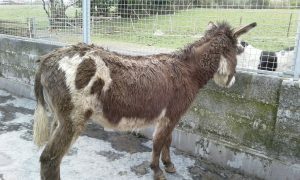 The 6th of August saw two new donkeys arrive, as usual neither were microchipped! 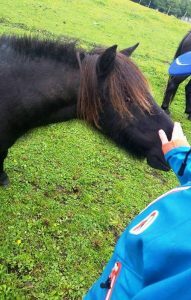 Once they are finished their quarantine the jack will be gelded and both of them will be chipped & passported prior to being advertised for rehoming. They are a bit nervous so also need some reassurance and gentle handling. 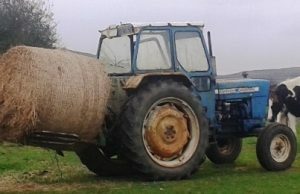 Our first few hours of preparation for another winter of feeding arrived on the 11th of August when we got a delivery of 330 square bales of hay which all had to be unloaded & stacked (and paid for €1,000) … It is amazing how quick you forget the effort involved with lifting & stacking that many bales by hand … many words of thanks were uttered to poor old battered Fordie who thanklessly drives the round bales for the herd for the winter every day as we could not face back to all the manual work that feeding square bales entails. Now that should bring you right up to date with where we are today, hope there is nothing we forgot to tell you about.